84 per cent say he's increased the risk of conflict. A man in Seoul, South Korea watches a TV screen showing U.S. President Donald Trump and North Korean leader Kim Jong Un on Aug. 10, 2017. The vast majority of Canadians think that U.S. President Donald Trump is adding fuel to the fire when it comes to North Korea and lack confidence in his ability to tackle the situation, a new poll suggests. The survey from Abacus Data, released Tuesday, also shows that Canadians want their government to push for diplomatic answers in the face of escalating tensions. 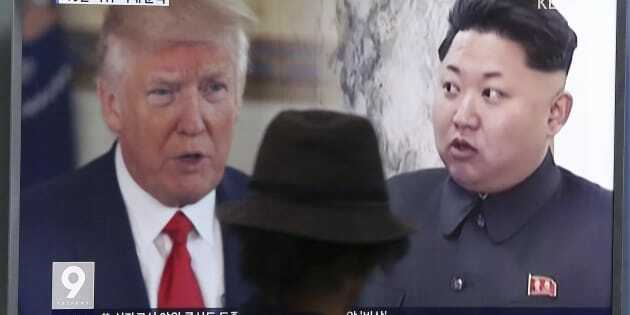 The poll suggests that more than six in 10 Canadians have been paying attention to the war of words between the United States and North Korea this summer and 69 per cent believe it is now "likely" the U.S. will take military action against the rogue state. Eighty-four per cent of respondents said they agree that Trump has increased the risk of conflict, including voters on different ends of the political spectrum. Ninety-one per cent of Liberal supporters, 94 per cent of NDP voters and 77 per cent of Conservatives share that view. A screengrab from an Abacus Data poll released on Aug. 22, 2017. Trump threatened North Korea with "fire and fury" weeks ago amid reports it had developed a miniaturized nuclear warhead that could be placed on an intercontinental ballistic missile. North Korean dictator Kim Jong Un ordered two missile tests last month and threatened the U.S. territory of Guam, before backing down. The U.S. and South Korea began joint military drills Monday that North Korea dubbed an invasion rehearsal and pledged would be met with "merciless retaliation." Asked about their level of confidence in the U.S. president to handle the crisis, 76 per cent of respondents said they had either "not very much" or "none at all." Just seven per cent told the firm they had a "great deal" of faith in Trump. The numbers show a majority of Conservatives — 57 per cent — lack confidence in Trump, while a whopping 85 per cent of Liberals and 85 per cent of New Democrats feel the same. Nearly eight in 10 respondents said they think the Canadian government should focus on advocating for increased diplomatic efforts, while 21 per cent back telling our U.S. allies "that we will support them if a conflict occurs." Thirty-six per cent of Tories back a more aggressive tone on a potential conflict, compared to just 15 per cent of Liberals and 11 per cent of New Democrats. Canadians are more split about what should happen if North Korea actually strikes South Korea, as Kim has long threatened. Roughly half of respondents think the U.S. should "definitely" or "probably" defend South Korea if that situation unfolds, while 34 per cent feel the same way about Canada getting involved. In the poll summary, Abacus' Bruce Anderson says the fact that Tories are "not hugely different" from Liberal or NDP voters on the questions suggests a "Trump base" in Canada could be hitting a new low. "The profound lack of confidence in the U.S. President to handle such a critical risk is unusual and another sign of how dismayed most Canadians are at the way Mr. Trump is approaching his responsibilities," Anderson said in the release. Foreign Affairs Minister Chrystia Freeland has said that Canada stands by its allies when threatened but wants to "pressure and persuade North Korea" that the path it is on will have "no positive ending." The heated rhetoric of late has also put pressure on the Liberal government to explain if it intends to join the U.S. continental ballistic missile defence system. New Democrats are opposed to Canada's participation. The House of Commons defence committee held an emergency meeting Tuesday on the North Korean threat. Liberal MP Mark Gerretsen later told reporters he thought Canada should reconsider its 2005 decision not to join the missile shield. Abacus' online survey was conducted between August 11 and 15 among a random sample of 1,500 adults, chosen from a representative panel of 500,000 Canadians. While the polling industry's professional body limits statements on margins of error for online polls, Abacus Data says a similar survey would have a margin of error of plus or minus 2.6 percentage points, 19 times out of 20.